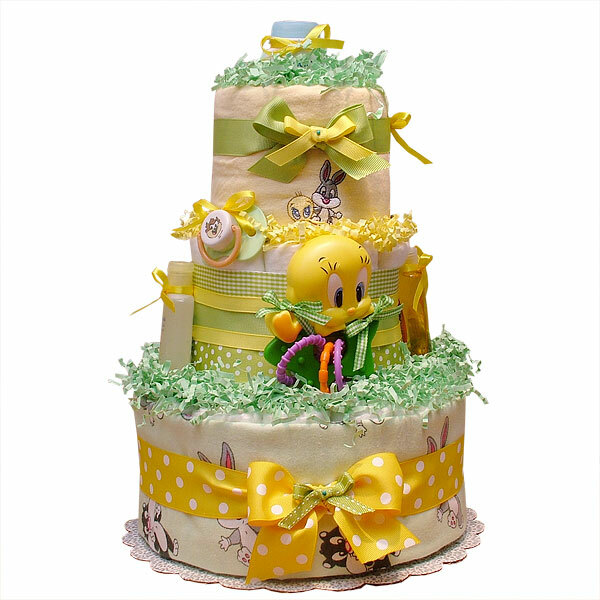 Beautiful, handmade three tiers Looney Tunes Diaper cake! It can be used as a shower centerpiece or just to give as a gift. This cake made of 35-40 Pampers Swaddlers diapers size 1-2 (8-15 lbs. ); Two flannel receiving blankets 100% Cotton; one rattle; one JOHNSON'S Baby Powder Pure Cornstarch with Aloe Vera & Vitamin E (Gently absorbs excess wetness to keep skin dry and soft) 1 1/2 oz; one Johnson’s HEAD-TO-TOE Baby Wash (1 fl oz. ); one JOHNSON'S Baby Shampoo (This mild, tearless formula baby shampoo is as gentle to the eyes as pure water) 1.5 fl oz; one pacifier; one JOHNSON'S SOOTHING NATURALS Nourishing Lotion (Moisturizes for 24 hours to give lasting relief to uncomfortable dry skin) 0.2 fl oz; one DESITIN Creamy (A creamy formula with Aloe & Vitamin E to prevent and treat diaper rash) 1/8 oz. Decorated with ribbons, bows, pins and crinkle paper. The diapers are held together by ribbons no glue on diapers. Ribbons are hand-stitched with white embroidery floss on the back of the cake, allowing for a clean, handmade look.